Note: Venus at this time was still in it’s early stages of colonization. 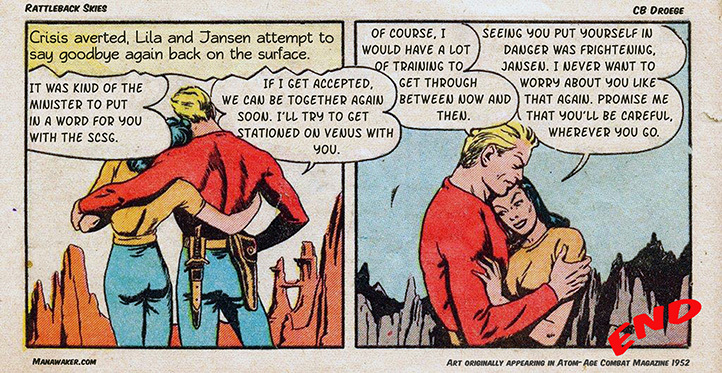 Agent Sorano would not be serving “on” venus so much as she would be stationed “above” it. There were very few people living on the surface, and there never would be a large population, as the Off World Directive would come before Venus became entirely terraformed, unlike Mars. Agent Serano would be on her way to the main office in Venusberg (Venus Station One in geosynchronous orbit) or to one of the larger aerostat settlements. This brings the first issue of Recycled Comics to a close. The next issue will begin very soon. Thanks for reading!